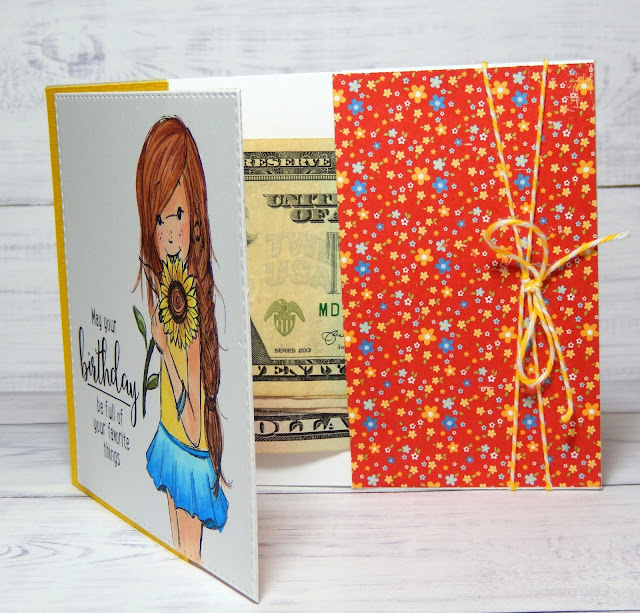 This is a mixed media style flower card. For this card, I used the new Tim Holtz distress oxide ink as watercolor. I love it. It has a chalk like soft look when dry. And so, I finished the image panel with a matte gel medium. I felt that it needed the extra coating to set the colors and to prevent a water reaction from the oxide ink. I was pleasantly surprised that the final colors came out more vivid. 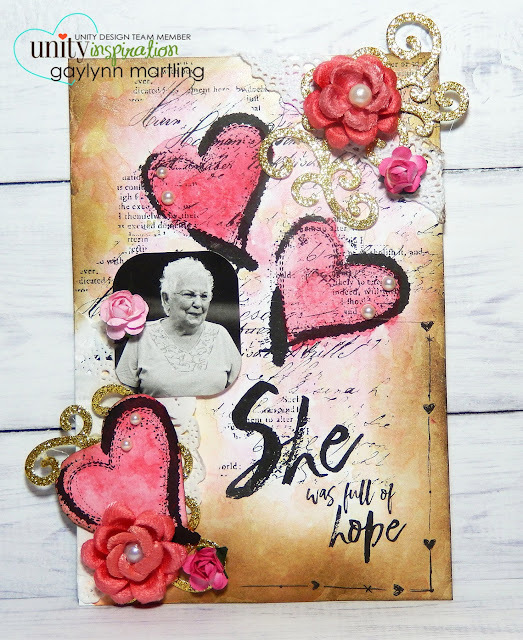 Supplies: Unity Stamp Co. Happiness Blooms Layers of Life kit, My Favorite Things die-namics, Ranger watercolor paper and distress oxide ink, Liquitex matte gel medium and Stick It adhesive sheets. Here is an encouragement watercolor beach girl card. This is great for encouragement. I colored this peaceful beach scene with watercolor and added a die-cut anchor. This girl is right where I would like to be, at the beach. Here is a quick tip video tutorial for this card. 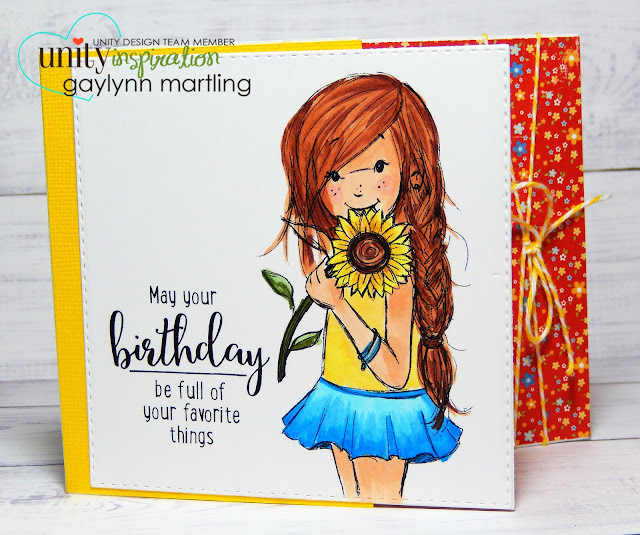 Supplies: Unity Stamp Co. Patience Girl by Angie Blom, dies by My Creative Time and Avery Elle, silver cardstock, Ranger watercolor paper, Prima water soluble oil pastels and brushes. Here is a sweet watercolor beach scene with a girl and a teddy bear. Sentiment: Thanks for being there. This image is in watercolor and is accented with a silver anchor and patterned paper trim. I just love the sweetness. Here is a video tutorial for this card. Supplies: Unity Stamp co. Friend In Me by Phyllis Harris, Sakura Koi watercolor, dies by My Creative Time and Winnie & Walter; Ranger watercolor paper and cardstock. This is a watercolor friendship card for almost any occasion or just because. Sentiment: You've got a friend in me. This is a sweet image by Phyllis Harris. I used watercolor and for the background, a paper crimper. This reminds me of my little niece and nephew. Here is a quick tip video tutorial. 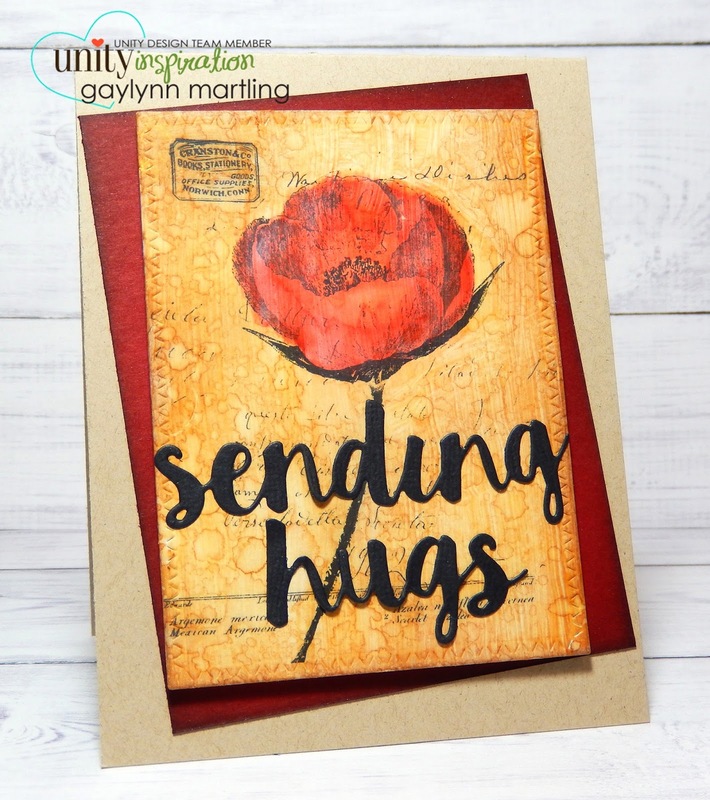 Supplies: Unity Stamp Co. Meant For Adventure & Friend In Me kits by Phyllis Harris; Derwent Inktense watercolor pencils, brushes, paper crimper, tag punches, MFT die-namics and cardstock. Today, I am sharing a gift card or money holder with a sweet image. Sentiment: May your birthday be full of your favorite things. This card doubles as a gift. The inside has a pocket to hold a gift card or cash. I made a quick tip video tutorial on how to make this tri-fold gift holder. Supplies: Unity Stamp Co. Sunny Days by Phyllis Harris & I Consider You Special kits; Copic markers, double-sided adhesive, BasicGrey paper and twine. 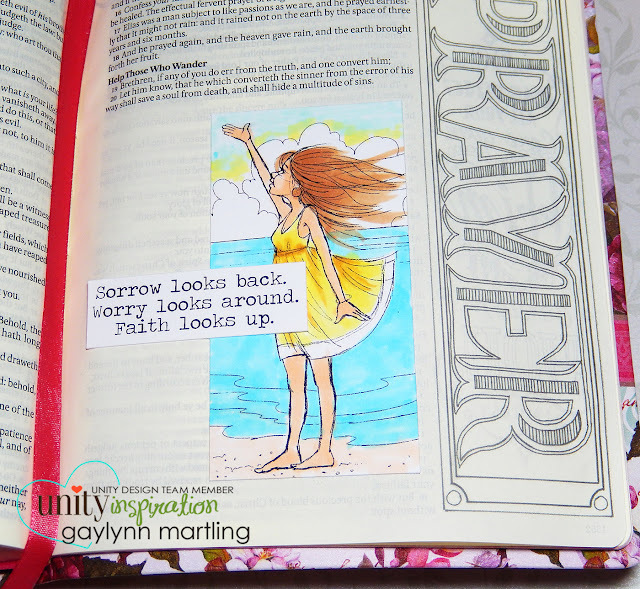 Here is a bible journal page with a tropical beach scene and an inspirational message. Sentiment: Sorrow looks back. Worry looks around. Faith looks up. This girl and beach scene was colored in with Copic markers onto a separate cardstock panel. I do not recommend Copics directly onto the bible pages. They tend to bleed through the pages. If you are interested in tips, I have a series of bible journal posts, documenting techniques used to decorate creatively on the thin bible pages. It is a trial and error process for me. I made a quick tip video tutorial on simple layering with bible journaling. Supplies: Unity Stamp Co. Faith Looks Up by Phyllis Harris, My Creative Bible, Copic markers and double-sided tape. Sentiment: Happy Father's Day. When you didn't have my hand, you had my back. 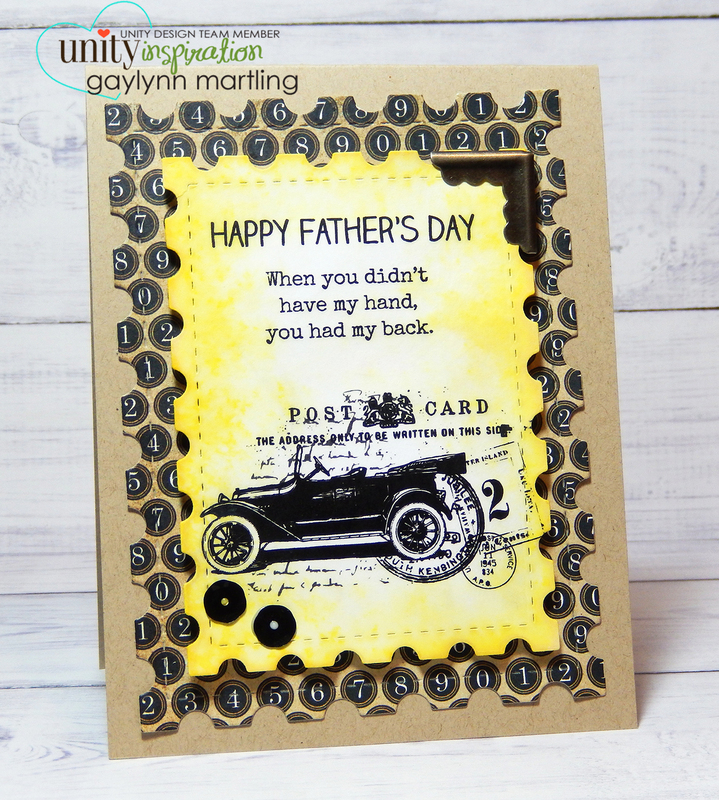 This is a heartfelt Father's Day card. This is especially fitting for fathers of adult or grown children. I like the saying and the vintage feel of the card. Supplies: Unity Stamp Co. You are a Classic, Beary Best Dad & Bonus Dad; My Creative Time dies, BasicGrey paper and Ranger distress oxide ink. Cheers to all the dads out there and to the ones who love like dad's. This is an adorable mouse & heart thank you card. Sentiment: Just a little thank you. I made a peek-a-boo window for the mouse, colored it with Copics and used floral patterned paper for accent. This sweet mouse stamp by Unity is offered free this weekend only on orders over $50. It is not yet available for sale. Supplies: Unity Mice Lil' Thank You, Copic markers, BasicGrey paper and twine. Have a wonderful Father's Day Weekend. Hello, it's Gaylynn. 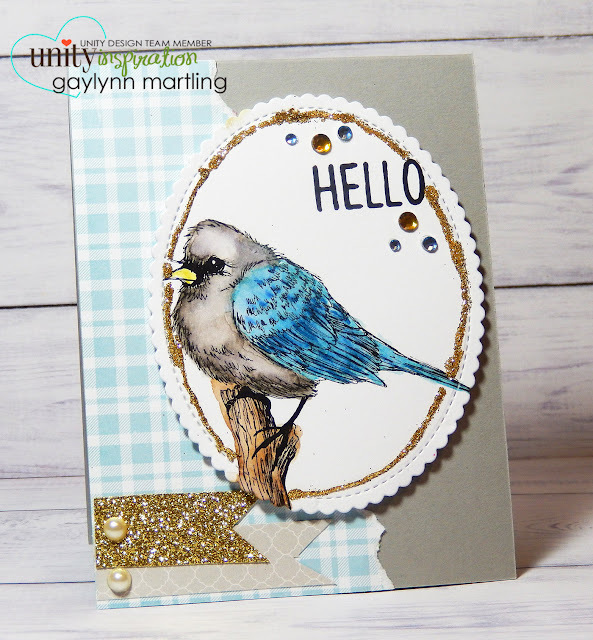 Today, the Unity Stamp Co. design team is having a blog hop with pretty inspiration along the way and prizes. This is a sweet new mini kit called Hello Little Birdie, by Tierra Jackson. Look at that face, awe. For this card, I added a frame of glue and glitter and then layered all of the panels. I used distress markers and a brush to watercolor the sweet bird. I made a video tutorial for this. Below are two more projects with the new mini kits. This includes the girl from the new mini kit Proud of You, Girl by Angie Blom. The sentiment is from Beautiful One. 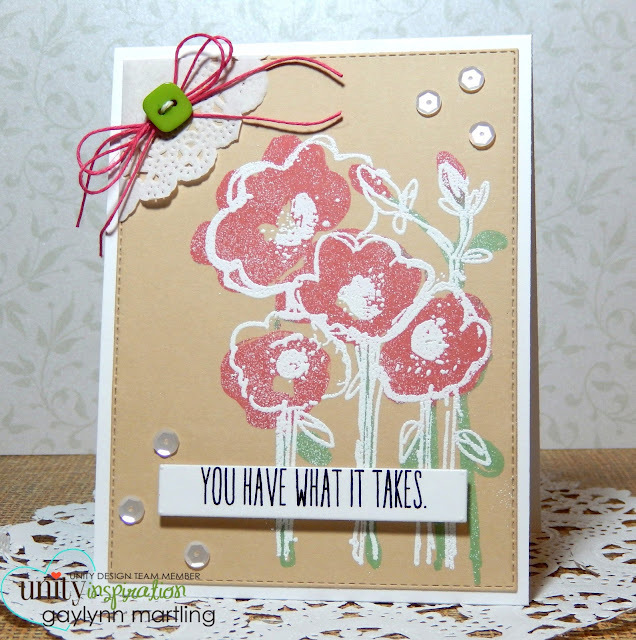 And this flower card includes two step stamping with the new mini kit Always By Your Side by Angie Blom and Lisa Arana. Hop along with us and then shop the Unity sale. PRIZE WINNERS WILL BE ANNOUNCED MONDAY NIGHT on the Unity blog. This one is near and dear to my heart. Sentiment: She was full of hope. This is a vintage mixed media style scrapbook layout page, dedicated to my lovely mama. She really was full of hope. I miss her dearly. I made this for a Unity release. When I saw this stunning sentiment and heart, I knew just how to use them. I had to make a tribute to her with them. Here is a quick tip video tutorial for this layout page. 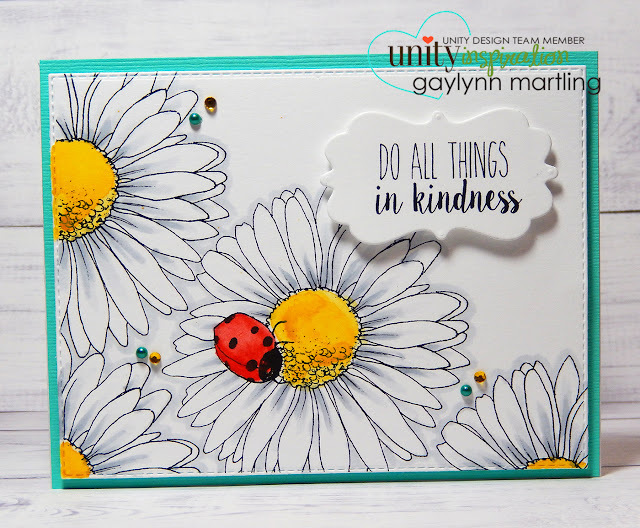 Supplies: Unity Stamp Co. Be Fearless and Unleash Your Happy SMAK Kits, MFT dies, distress ink, Faber-Castell Gelatos, doily, lace, pearls, Prima flowers, photo by Olly View Photography and glitter paper. Thank you for visiting. Have a lovely day. Here is a thinking of you card using watercolor and golden shimmer. Sentiment: I think of you often. For this card, I used a mix of ink spray and gold shimmer watercolor. The technique I used is called ink smooshing with a little bit of paint brush color mixed in. I was going for a mixed media look, in keeping with the sketchy style of the images. The card has a beautiful gold shimmer which looks prettier in person. Supplies: Unity Stamp Co. Time To Enjoy Life Kit of the Month, My Creative Time dies, Gansai Tambi watercolor, Dylusions ink spray, Ranger watercolor paper, paint brushes, adhesive pearls and twine. Today is the launch of a brand new monthly membership at Unity, called Uniquely Unity. This beautiful flower and ladybug is the June offering ~ A Daisy & A Lady. Sentiment: Do all things in kindness. For this card, I duplicated the daisies. I added a little watercolor to the centers, then added gray highlights for the white petals. Here is a quick tip video tutorial for the daisy and lady kindness card. Supplies: Unity Stamp Co. Uniquely Unity A Daisy & A Lady, Copic markers, Sakura Koi watercolors, My Creative Time dies and Ranger watercolor paper.